The era of the professional wireless operator has ended. CW communications has all but disappeared from anywhere other than the amateur radio community. The maritime, airline, military, and telecommunications industries no longer employ radio operators. Computers, digital technology, cellular networks, and satellites provide reliable communications capabilities over every inch of the Earth's surface with a reliability and reach that would have been beyond anyone's wildest imaginations ninety years ago. The arcane skills and legendary dedication of of the maritime radio operator, the pioneering spirit of the airborne operators, and the dedication of point-to-point operators if no longer necessary. But at one time, virtually all long-distance communication, most military communication, and all the communication with ships at sea demanded highly skilled and dedicated radio operators -- the "brasspounders." These skilled and dedicated operators often risked danger from sea and storm as well as long and tedious periods of separation from loved ones. They served their employers, their communities, and their nations. 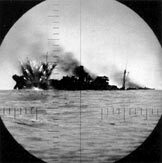 Countless lives have been saved, untold disasters averted, thousands of rescues have been facilitated by "ships sparks" during the era of the professional radio operator. 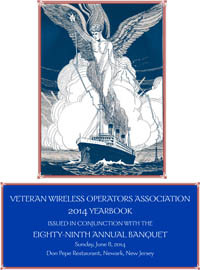 For 90 years, the Veteran Wireless Operators Association has the preeminent fraternal organization of these highly-skilled radio operators. In 2015, the Board of Directors of the VWOA formally redefinined the organization. It is no longer a membership organization of active and retired radio operators. 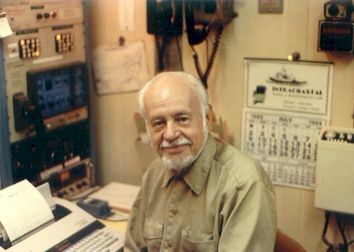 Today and for the foreseeable future it is a not-for-profit historic organization dedicated to honoring and preserving the service, history, and sacrifices of all radio operators -- at sea, in the air, and on land. The 2014 VWOA Yearbook has been mailed to all members. You can read and download the electronic version (including more color pictures) by clicking on the cover image below. Right click to save a copy to your computer. Welcome to the Veteran Wireless Operators Association Home Page. We hope you find it informative about our organization, its members, and its proud history. 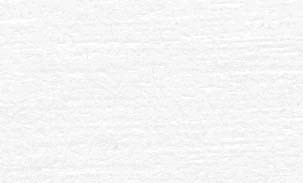 We have a lot of information on this site. Please feel free to explore. Enjoy your visit to our website. Try Basic Facts About VWOA to find out about our organization's unique history. Look into Activities and Awards to find out what we are up to and about the many distinguished individuals who have been honored by the VWOA over the years. Click here to open a new window and view the fascinating 20 PDF page (2.9 MB) presentation: "Sparks at Sea" by the late Dr. Miles MacMahon. To speed things up, we recommend that you right click on the link and save it to your local drive before viewing it. Don't forget to explore the VWOA Scrapbook for pictures and notes, both and past and present, from the VWOA library. Oh yes, any contributions for the scrapbook are always welcome, we are always looking to add our library of old photographs, books, and QSL cards.